We all know the value of staying cool. When it gets hot outside, it will get hotter inside your home unless you have an air conditioner. Unfortunately, many people are unable to afford air conditioners because they are expensive and they make your electric bill go sky high. Thankfully, there is a full-proof solution to beat the heat of the summer. Lasko 2554 Wind Curve Fan might be a great alternative to expensive and bulky air conditioning units. Maximize air delivery and purify the air in most any area of your home or office with the Lasko 42 inch tower fan. This Lasko 42 inch tower fan is a solid entry level tower that delivers decent airflow and desires temperature control. It is more than capable of cooling down a room over a period of time. The high-reaching tower design and sophisticated profile of the tower fan with ionizer will complement any home or office decor. It is devised in a lightweight fashion as to be easily moved from one spot to another, in fact, the model weighs in at less than five pounds. Even for those that don’t live in hot climates, you can still make full use of it. Lasko 2554 tower fan has the three-speed setting mode and they are: low, med and high speed modes. You can change the speed though you are far from the fan, only you have to press the button of the tiny remote. In case, you are near the fan than you can use the manual control panel located on the top of the fan. Some of the popular tower fan brands like Dyson AM07 tower fan have 10-speed setting. Lesser speed setting mode doesn’t mean this fan is not powerful. This Lasko fan really blows speedy air. But less speed setting may create problem to adjust the speed according to your demand. This Lasko wind curve fan can oscillate from side to side by a range of 90 degrees. Honeywell Quietset tower has a little wider range of oscillation. But there is no complaint from the user of this fan regarding the coverage of the room with this range of oscillation. With 90 degrees oscillation, it will cover a large size room though you placed it in the corner of the room. This Lasko tower fan has a built-in remote control storage that is perfectly hidden in the back side of the fan. There are 5 well design buttons in this remote control. You can use this remote control to operate the Power, Speed, oscillation, timer, and Ionizer. So, enjoy your favorite TV serial in your living room and comfortably operate the tower fan using the remote control sitting on the sofa. The remote control needs two AAA size batteries and this will not include with this Lasko fan package. You can set the preprogram auto shut off from 30 minutes to 7.5 hours. So, this will save lots of electricity bill and perfect to use in the kid’s room. The digital control of Lasko 2554 comes with 8 LEDs and they show the status of the fan. From left to right, first 4 red color LEDs indicate how much time is left from the automatic shut off feature. If 1 LED is on then its 30 minutes left to automatic turn off and 2, 3, 4 LEDs representing 1 hour, 2 hours and 4 hours respectively. The next 3 green LEDs indicate in which mode the fan is operating. The first green LED from left to right indicates the LOW-speed mode. Second and third LEDs represent the MEDIUM and High-speed mode respectively. The single blue light indicates whether the air ionizer is turn ON or OFF. Lasko 2554 wind curve fan has 5 controller buttons in the top of the fan. They are used to control the Power (ON/OFF), Oscillation (ON/OFF), auto shut-off timer (every pressing of this bottom will add 30 min automatically), and last the fan speed mode (LOW, MEDIUM and HIGH). Lakso Engineers has upgraded the design of the previous version of Lasko wind curve fan (Lasko 2551) and introduced this newer version Lasko 2554. This newer version Lasko fan made with fake wood instead of sleek plastic. The previous version looks very cheap plastic fan but this newer one put out the limitation of the previous version with fake wood materials. This Lasko tower fan is available in two different colors maroon and silver. The stylish curve design of this 42 inches tower fan will definitely give a very special look to your house. The slimline style and dark color tones will blend with your contemporary home décor. You will get a 4 feet long black power cord with a beautiful blue safety plug. A well-placed carry handle will help you to take the fan from one room to another. Lasko 2554 is unquestionably a savvy fan. For the elements it accompanies, for example, the tender breeze and air purifier, this is an awesome purchase. It iѕ additionally significantly less expensive than the Dyson tower fan models which can every now and again run a few hundred dollars. Price is around $60, this is considerably less expensive. This item iѕ likewise somewhat more costly than a conventional working area fan. While this is generally a superior item with more elements, it iѕ likеwiѕе more соѕtlу. This best tower fan has all that you’re searching for in it and it does these things well. It keeps the air fresh and new and accompanies a vitality sparring mode that will keep service charges low. With such a variety of various choices for different capacities, this is a top notch show that can successfully contend with the best of the models out there. 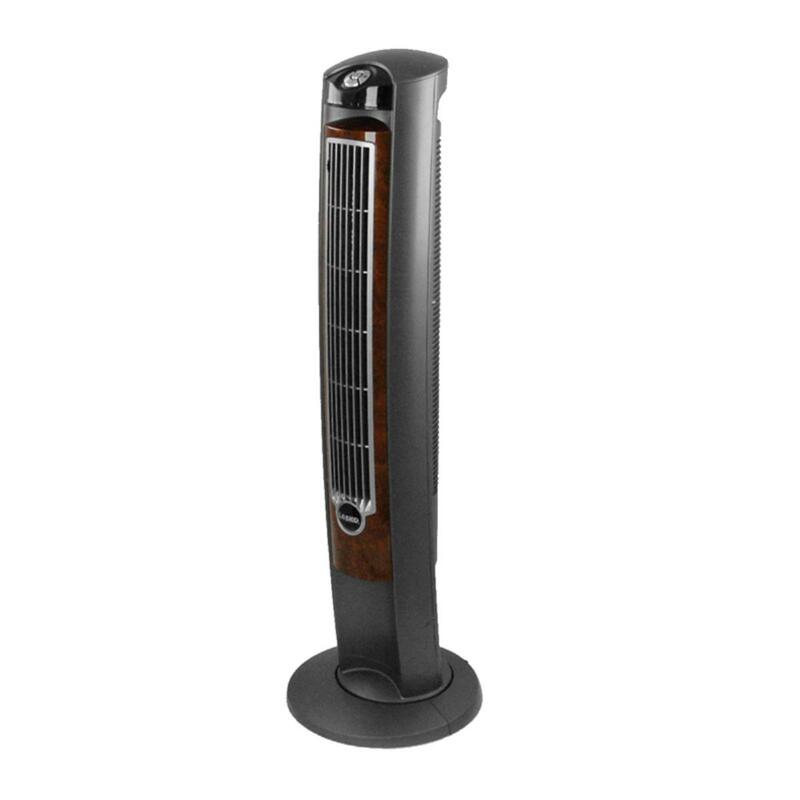 Lasko 2554 tower fan is a test to break this item. The tall tower outline accompanies a durable base that makes is trying to thump even. You could even lay this gadget on its side and still have it work well. With a handle to effortlessly transport from spot to place, you shouldn’t need to stress over dropping this gadget either. Without pivoting sharp edges, there essentially aren’t a lot of parts to this gadget you can break. This is an exceptionally strong thing. At low speed, the reading is 58 decibel. At medium speed setting, it is churning out 60 decibels. And last it is around 63 decibel at high-speed mode. So we can say this produce loud sound at med and high-speed mode but quiet in nature in low-speed setting. And it makes whirling at the lowest speed like a car passing an underpass. Lasko 2554 tower fan generates lesser noise compared to traditional fans that enable the user to sleep fervently. This gadget is fresh and smooth. The customary roof fans and work area fans accompany pivoting sharp edges that can be exceptionally commotion. This gadget is considerably calmer than those permitting you to stare at the TV and have discussions without being upset. Then again, this gadget is still a tiny bit louder than the Dyson models that essentially push the air as opposed to creating their breeze. While you can even now hear the engine running, it is peaceful. As the blades of the Lasko tower fan is hidden, they collect a great amount of dust but you can’t see the dust. You can simply clean it using compressed air or an air compressor. You don’t need to disassemble this tower fan. So, cleaning this Lasko 2554 tower fan will take 5-10 minutes. You have to clean it on monthly basis. ♡ The base is pretty sturdy. ♡ Easy to assemble. Just need to attach the 2 piece base together with the fan body. ♡ It blows really good air around your room. ♡ Home delivery of Lasko is extremely quick. ♡ Pretty lightweight and easy to carry with the carry handle. ♡ Smooth operation as expected. ♡ Lowest setting blows out ample cool air. ✘ The blue “ion” indicator light is really bright. Lights up a small dark room and trouble you to sleep at night. ✘ Noisy at high speed mode. ✘ No digital display available. Some people believe that this Lasko tower fan emits ozone gas in the environments. But We can’t find such kind of emission for this fan. This fan is 100 percent safe for the environment and global warming. No, this fan usually made for working in a vertical direction. If you use it in the horizontal direction, some functional misbehavior or malfunction will occur in the fan. Lasko 2544 wind curve fan is rated at 0.4A,120V AC, and 60 HZ. So this fan is standard for USA household. Nope, this fan does not come with a washable filter. The fingers of a baby can be entered easily through the fan grill, but their fingers can’t touch the blades of the fan.As the blades are kept at a fair distance from the grill of the fan, this fan is safe for the family with a baby. If you are cleaning this Lasko fan for the first time, it will seem tough for you. But if you clean it regularly, it will be a piece of cake to clean Lasko tower fan. In standard seed setting, this tower fan will consume 48 watts in per hour. So this fan is very energy efficient. It gets really warm in my room over the summer and I did not want to purchase a ceiling fan, I’m more of a tower fan or pedestal person. I have allergies so I wanted something that will help clearing particles from the air and this fan with the ionizer was the perfect fit. Assembly is superb easy and takes just a few minutes. I always have it on the lowest speed which blows a lot of air (unless I just came in from a workout or the hot sun, I up the speed.) Unfortunately, the remote iѕ very cheap and slow, I always use a great deal of force and pressing like ten times just to get it to work. I finally gave up and tossed the remote and installed an app on my Smartphone instead that controls the fan. Other than that this fan is amazing! I use it literally EVERYDAY and it also helps me sleep deeply at night. If you have doubts, erase it from your mind, this fan is definitely worth buying!